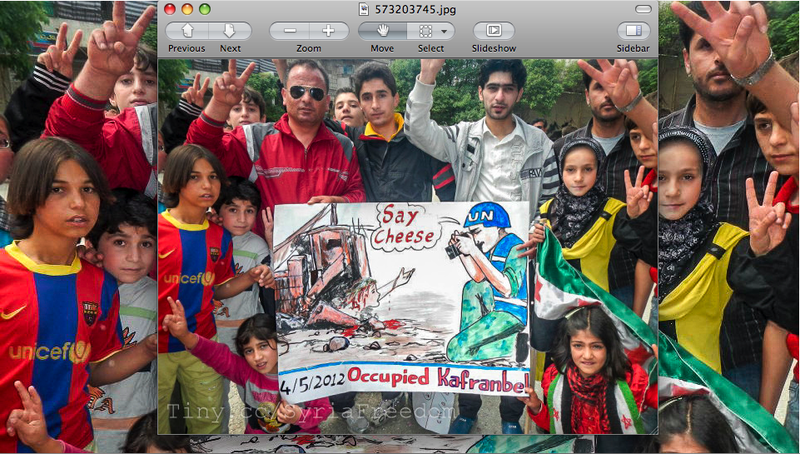 A photograph posted by @SyriaTweet on Twitpic.com shows a group of people, from various age groups, one hand flashing victory signs, the other holding a drawing. The drawing is of a UN Observer taking a photograph of a woman under rubble, with a word cloud above his head reading “say cheese.” The UN soldier is documenting instead of saving the victim, thus the drawing implies that camera signifies inaction. Another drawing shows Assad holding a blood stained axe shaking hands with Kofi Annan on a pile of bodies, while posing in front of UN observers cameras. Elsewhere, there is a photograph of group of protestors holding a sign that reads: “UN is killing us.” While the first image suggests that the UN is watching and not doing, the rest imply that not only UN is not “doing” anything, but rather it is responsible for the continued violence in Syria. Hito Steyerl writes how the over-exposed, horny, emaciated beauties of hyper capitalism save the rest of us from the burden of representation. These creatures supply the industry with the required flesh to anthropomorphize the commodities that we are applied to later on. According to the dictionary, before its post-1839 currency, the word “exposure” meant “to leave without shelter or defense,” from M.Fr. exposer “lay open, set forth,” and although it still carries this meaning in its contemporary use, not surprisingly in the early days of photography, exposing oneself to the camera was cautiously refused, in particular by philologues. “The same Balzac who claimed to have drawn up all of his fictional figures like daguerreotypes” writes Kittler, “also said to his friend Nadar, France’s first and most famous portrait photographer, that the himself would dread being photographed. Balzac’s mystical tendencies led him to conclude that every person consists of many optical layers – like an onion peel – and every daguerreotype captures and stores the outermost layer, thus removing it from the person being photographed. With the next photograph, the next layer is lost, and so on and so on until the subject disappears of becomes a disembodied ghost (see Nadar, 1899). Edgar Allen Poe, who also wrote about photography as one of the wonders of the world, made this phantasm universal by positing the thesis that images in general are deadly for their object. Poe’s painter creates a portrait of his beloved without noticing that she grows increasingly pale the more that her oil painting acquires the color of human flesh. Painting, with its extensively discussed handicap of aging pigment, thus uses a photochemical effect against people as if it had become photography. As soon as Poe’s fictional painting is completed, the painter’s beloved drips dead.” Kittler also quotes from Photography and Revenge by Apollonius von Maltiz, “and the mother, who is photographed, is appalled: “Let to the altar from the nursery, beautifully named, deified by painters […] sculpted in marble by Thorwaldsen – now in the hands of a charlatan.” And while Dorian’s portrait was withered by his sins, it was left unexposed as it started to blemish. Until the invention of photography, for the most of 19 centuries, Christ carried the burden of representation, before it was redistributed to all humanity. Alphonse Bertillon’s mug shot became a universal practice and the “model of criminal became part of our everyday life,” which prompted Thomas Pynchon to ask his readers: “Is that who you are, that vaguely criminal face on your ID card, its soul snatched by the government camera as the guillotine shutter fell? Hence, those exposed, “left without shelter or defense,” if left with a digital camera, remove themselves from the rubble, before being pictured within it. 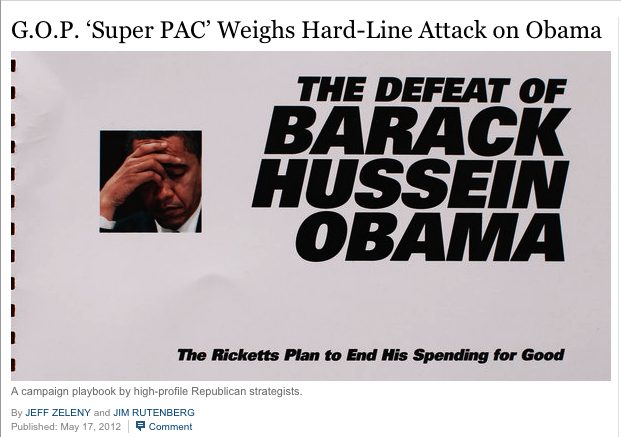 Google image search is topical. You put in a word, it gives you an image. You enter ‘plastic cup’ it gives you plastic cups, you enter ‘blobs on Mars’ it lists you images of blobs on Mars. The database is constantly growing, “Egyptian presidential elections,” did not generate images as much as it does today. The google images’ search result has the ‘look of content’, it has the appearance of intentionality, a hint towards conventions that assign meaning to taxonomy. But conducting searches is a movement of subjectivity, that gives form to intentionality by inhabiting the format of ‘results’, while modifying the methodology of grouping. I’m Google, is Dina Kelberman’s tumblr stream of images that follow a formal movement where batches of pictures and videos seamlessly follow one another, as we move from clouds to burning bushes to parking lots to wigs. 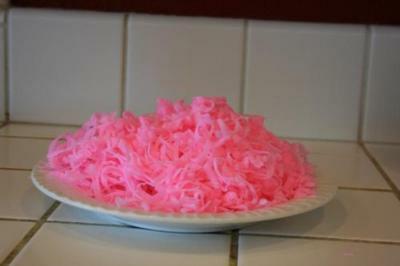 It is formal repetition that moves toward content, and aggregation is not a collection of the same. One wolf is different from a pack of wolves. The tumblr while inhabits the look of generated results, it gradually makes visible a flow of form that plays the role of ‘the look of content’ like an old man who plays the role of a young woman acting the role of a young woman. It is through this second layer that the visual aggregation performs content. But on the other hand, the I’m Google, shows how in fact the medium itself prompts subjectivity through its application, and as such it points to the rearrangement of visual experience. This second turn becomes significant while looking at topical hoardings online, in particular those that follow a certain ideological or political intention. For instance, browsing through more than 8000 videos that the SyrianDaysOfRage youtube page has uploaded since July 2011, one cannot fail to recognize certain formal patterns. It is through the application of youtube to the images that these forms become visible, while the pre-established content hinges upon the aggregation that followed. The image on the internet is an image of the internet. Its provenance does not lose its relevance, but it is re-rendered after it is encoded into HTML. Thus the image is subject to the modes of application, taxonomy, access and classification on the internet. As such the series of interfaces, and the lines of encryption that assign its location are part and parcel of its modes of signification. Each of these processes further “inform” the image in Flusserian terms. Artist Constant Dullaart, for instance, investigates how these digital vernaculars affect human gestures e.g. in becoming a DVD player’s screen saver in Joshua Tree, California; or how what was known as video, is now filtered through an online interface e.g. 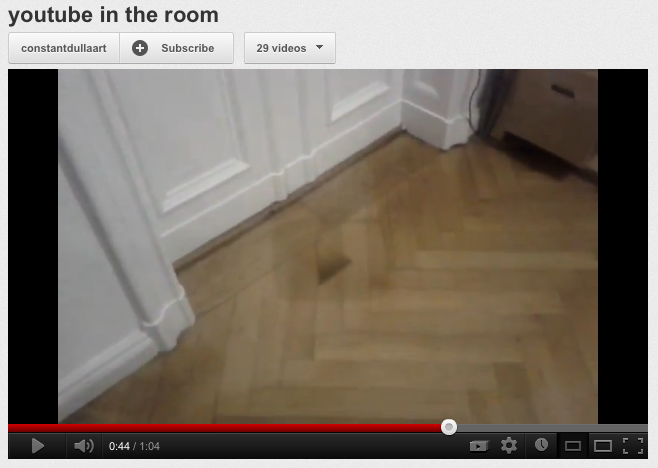 youtube in the room, where the youtube play button stands between the room and the camera. In this piece, it also prompts to certain objectivity of the interface as the sign is printed on transparency and held in front of the camera, and thus at times a reflection makes the filtering layer visible. It is a play button that does not operate in a click. This however does not imply a mere reduction of discourse to medium specificity, rather, it is a shifting location of experience that is significant. While for instance the urban and landscape experience was for the most part a horizontal one (with the exception of post WW I reconnaissance), now it is a combination of a vertical and a horizontal form of navigation. Thus the image of the city, has changed as it is encountered through navigation interfaces and maps. This shift of location of experience is highlighted in many of contemporary commercials, online and on television, where the product is advertised through a series of actions performed by the protagonist on a gadget, mostly a device that takes photos, a touchscreen browser, or a combination of both. Needless to say that these are not advertisement of the mediatory device. Thus an experience that is not worthy of mediation is discarded and unworthy of being advertised. As explained in the title, the youtube video Premier League – Last moments – My Reaction. Manchester City win Title. United Fan. CJB, shows a man’s reaction to the final minutes of Champion’s league final game. 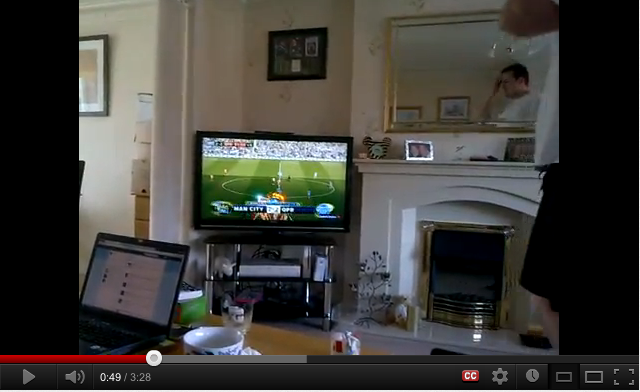 In the video we see a man watching soccer, in his living room, sometimes talking to his girlfriend (who we do not see), while we also see that two laptop computers logged onto Facebook on two coffee tables. Here, a feeling (of loss in this case) is experienced through its online representation, without which is not worth feeling. The video though, is hardly unique, there were too many reactions to the final minutes of the game online that talkSPORTmagazine has created an online compilation of them. Nevertheless, although these emotions were not experienced offline, they are hardly unique to each individual. On Monday, May 21, 2012, a bomber blew himself in Yemen’s capital Sanaa, killing more than 90 people and leaving 222 injured, says Yemen’s defense ministry, according to the BBC. 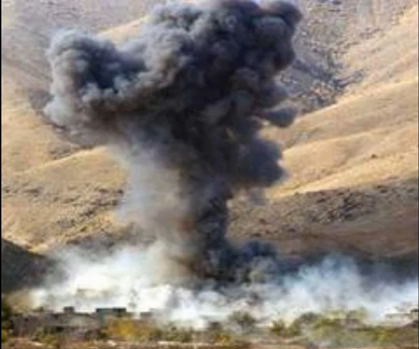 On youtube, there is a one minute video with the title 21/05/12 – Yemen Suicide Bomb Kills At Least 96 Soldiers. The video, does not show footage of the bombing or the security, paramedic or media responses to the event. It does not show images of blood-covered dead bodies on the asphalt, burning cars, crying witnesses, frantic policemen. Rather, following a Corona Light commercial, it is a silent, still image of a bomb going off in what appears to be a village on the edge of the desert. Half through the video, the image disappears and a text takes its place over a black screen: at least 40 soldiers have been killed in Yemen following a terrorist bombing. The discrepancy between the image and the title, might be due to the difference between the total casualties and the military casualties, leaving a total of 50 civilian deaths. What is significant about this video, is not the information that it is sharing, but rather the way that it is relaying this information. It recalls conceptual art strategies of media displacements, using one medium to address the other, here a photograph as video, a text as a still image and video. A picture of a bombing, here becomes a symbol for bombing, no matter what is the source and the context of the image. One image of explosion, the video suggests, can be used to visualize other explosions. Curiously, through google image search, it appears to be that the image of the explosion used in the video, is in fact not from Yemen. Rather, its related to the use of cluster bombs in Afghanistan by US forces, and among other articles, it accompanies a BBC report on developments towards a new treaty to ban the use of cluster bombs in combat. A treaty that “[t]he US has rejected …, saying the weapons have a place in its arsenal,” according to the BBC, adding that “The charity Handicap International estimates that 98% of those killed and injured by the weapons are non-combatants,” while “27 percent are children,” according to New York Times. While the predator and the victims differ, a single image of explosion encompasses the horror of modern warfare. The video also shows how photograph transfigures from an image to symbol. This morning, May 17, 2012, the New York Times published a storyboard for a five-minute film “obtained” by the paper. According to the Times “The film, titled “Next,” was proposed by Strategic Perception, a political public relations firm founded by Fred Davis. The storyboard provides a rough outline for a film highly critical of President Obama’s background and policies.” Notwithstanding the content of the film, featuring such particularly technical document on a morning paper is significant, as it suggests that reading of a storyboard is not restricted to filmschool graduates and the industry at large. Although, this might not be quite what Guidio anticipated from the screenwriter of the future, but the featured storyboard is production-ready and anyone familiar with the profession’s basics, could potentially imagine, and produce the film. “It is not the person ignorant of writing but the one ignorant of photography, who will be the illiterate of future,” writes Benjamin in Short History of Photography and here the Times confirms what Benjamin’s predicted in 1931. What used to be the under the hood nuts and bolts of the industry is now a common lexicon available and decipherable by the larger populace and thus it’s become evermore clear that the function of media criticism has [long] shifted from the mere exposure of the underlying apparatus. The apparatus has already mooned the audiences and moved on, and so writes David Foster Wallace: “what explains the pointlessness of most published TV criticism is that television has become immune to charges that it lacks any meaningful connection to the world outside it. It’s not that charges of nonconnection have become unture, but that they’ve become deeply irrelevant. It’s that such connection has become otiose. Television used to point beyond itself…Today’s mega-Audience is way better trained, and TV has discarded what’s not needed (real life). A dog, if you point at something, will look only at your finger.” Thus one does not look for truth in the media, but rather for entertaining affirmations, divided into political comedy on the left and propaganda on the right spectrum of the [American] media.